We got this spacious site. 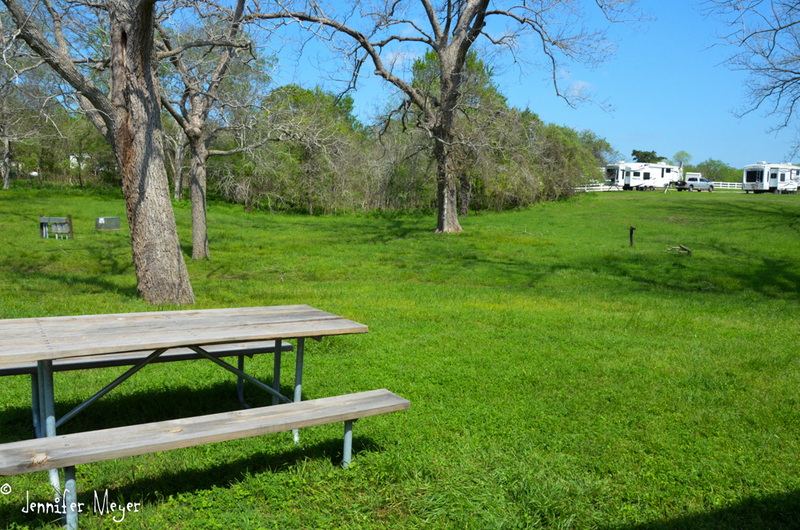 The Colorado River Thousand Trails RV Resort is about halfway between Houston and San Antonio. It was a perfect place for us to spend some time before meeting our goddaughter in San Antonio. 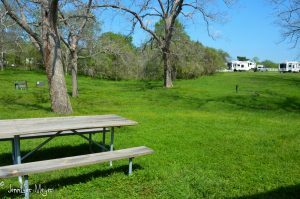 We were pleasantly surprised by this open, green place right on the river. All the full-hookup sites were taken, but we were more than satisfied with the water/electric site we chose, next to a park-like area, with no one else near. With careful water usage, we were able to make it through the five days without having to dump our tanks. 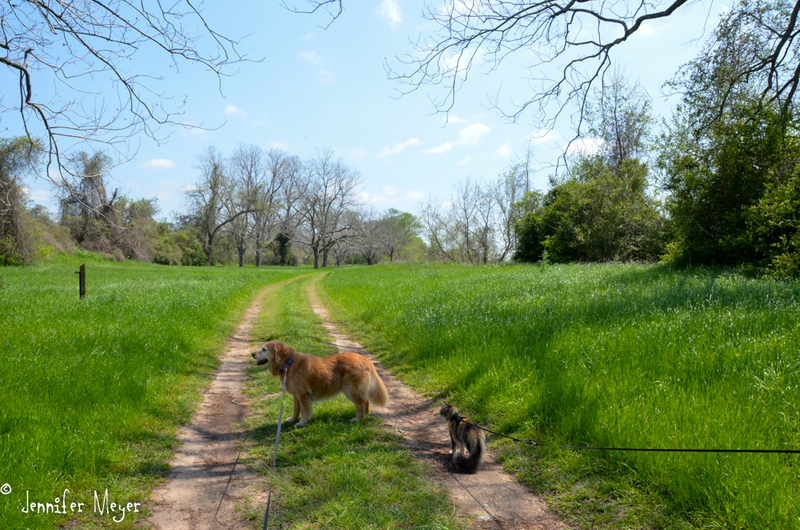 There were miles of pastoral trails in the campground, and we took Bailey and Gypsy on lots of spring walks, through emerald green grass dotted with wildflowers, oak trees not yet leafed. 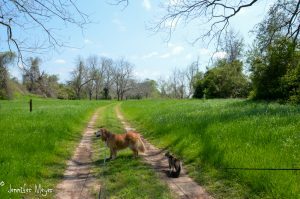 Although there were lots of other campers in the park, we never saw others on our walks, and in some areas, Bailey got to run free in meadows. 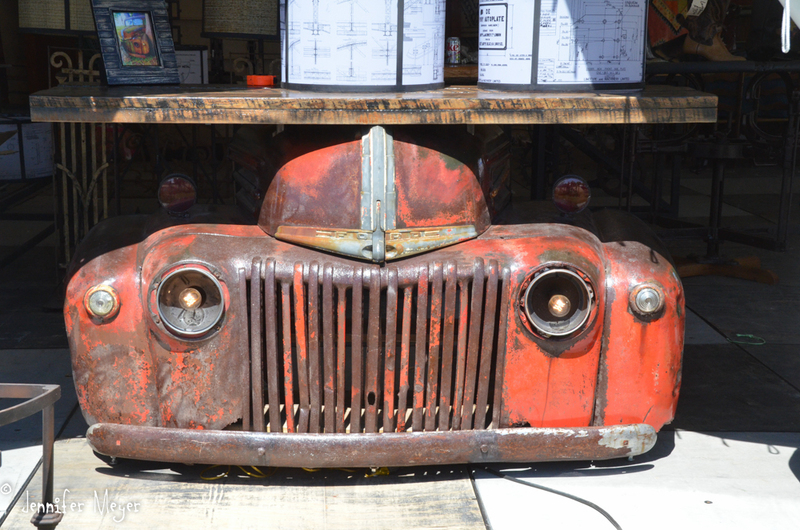 We’d heard for years about the antique fair in Round Top, Texas, a town of 900. 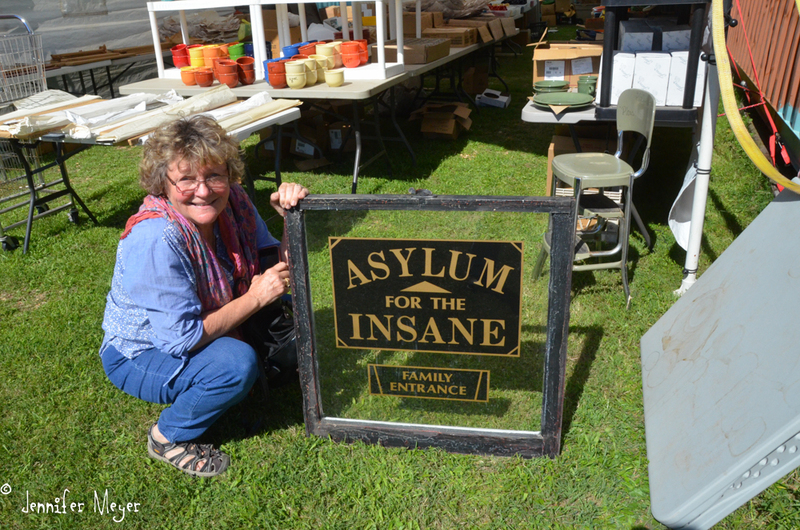 For three weeks every spring, hundreds of antique vendors and designers set up tents on acres of land, and customers come from all around the country to find unusual treasures. It was only 45 minutes from our campground, so we set off on an outing one day. We stopped first at Fayetteville, a sweet little town with a town square and lots of restored older houses. My sister and I had come here years ago with our mom, and we’d had lunch at Orsak’s, a tacky but popular local diner. So of course we had to eat there. You’ve got to love a place where you can get a BLT and fries for $3.00. I splurged and got the country fried steak sandwich for $5. Both our meals included a free piece of slightly burnt cherry cake with confetti icing. But we also tried the buttermilk pie. 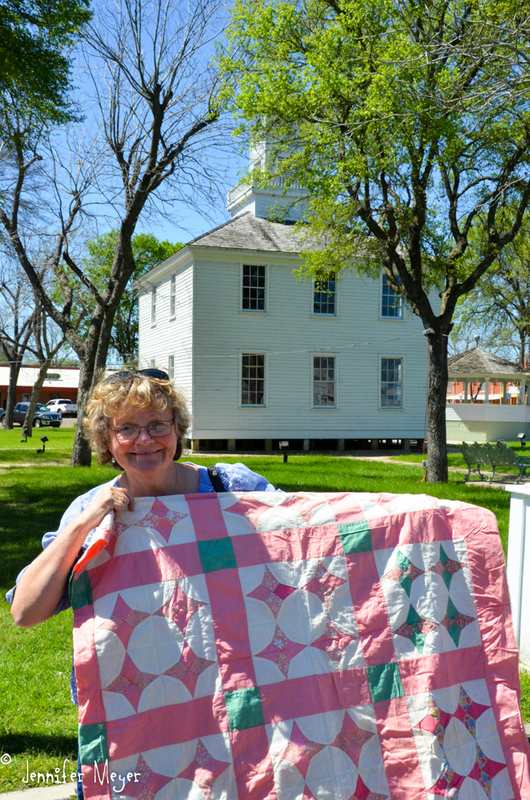 Across the town square was a small outdoor antique sale, and Kate got a 1930s quilt top for $40. We also checked out a boarded up house that my sister, mom, and I had explored earlier. It turns out the Round Top antique fair wasn’t open that day. We stopped and looked at what several vendors were setting up. There seemed to be a common theme or style: rustically repurposed materials. There were couches made from wheeled luggage carts, tables built from polished barn wood, stools from tractor seats, lamps from hitching posts. No cheap bargains here. These were pieces you’d find in Manhattan penthouses with a folk flair. 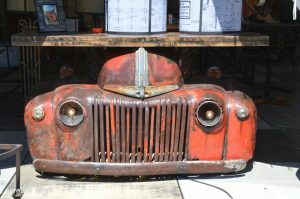 The real treasure hunting was down the road in Warrenton. Here there were miles of tents and open-air vendors. This was a true flea market, but larger than any I’ve ever seen, and with the most unusual pieces. Gas pumps and signs, coin-operated rocking horses, a pink enamel dental chair, carnival sideshow signs, and loads of old doors and stained glass windows. We walked for miles among the booths and tents, and I took lots of photos, but living in an RV sort of kills the urge to buy impractical curiosities. Our campground was just a few miles from Columbus, so we drove in one day to check it out. 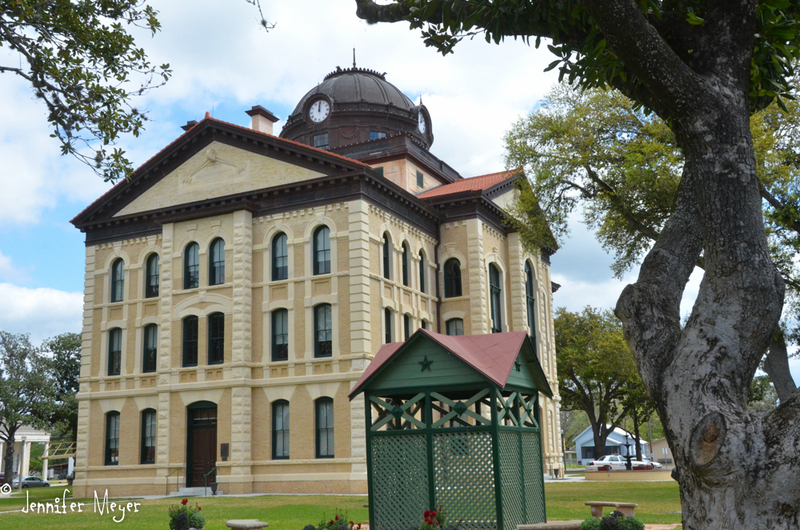 It’s a typical small Texas town, with a stately county courthouse centered in a town square. An old opera house serves as a Visitor Center. 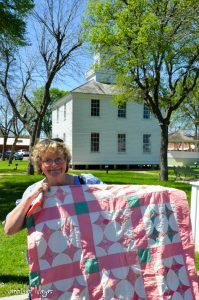 And a radio tour took us to several historic houses near downtown, including the log cabin of one of the town’s earliest settlers, during the Spanish War.